Your concrete driveway is designed to bare the weight of your car and of course is used continuously for entering and exiting your home. Your concrete driveway is also the perfect place to walk , play and run on by children and your pets. It’s not unusual to see kids riding their bikes on the driveway and if your like me it’s a good place to leave the mower after cutting the grass. Your concrete driveway handles quite a lot of traffic and weight on a daily basis. All of this traffic usually means a lot of mess because every vehicle, foot or toy that crosses your driveway leaves behind quite a lot of dirt. The dirt gets ground in and then retains moisture and algae begins to grow . Before long your beautiful expensive driveway becomes discoloured and sometimes black or green and even slippery when wet. The quickest, easiest and best way to get your driveway nice and clean again is by using a pressure washer for the cleaning task. Pressure washers jet a stream of high-pressure water that you can use to get in-between all of those tiny cracks and grooves, to flush away stubborn dirt and contaminants and pressure cleaners save plenty of water each and every day because they give a much cleaner result with less water usage than your hose. If you want to get the best looking and cleanest results from pressure washing then you are very welcome to give these five tips a try. Naturally, you need to remove things that are going to be in your way such as vehicles, toys, flowerpots and more. Once you have cleared the area you can prep the surface by either sweeping the area to be cleaned or using a garden blower to remove loose particles and leaves. For best results wet down area with water 10 min before you start the cleaning process. This will soften the dirt on the surface and make it easier to remove. 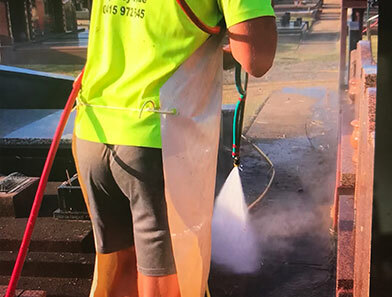 You need to understand your pressure washer fully before you start so you can get the best possible result without damaging your expensive machinery. Read the manual before you start. Your manual will explain all the needed steps for setting up the pressure washer such as connecting the hose and spray wand and more. You will also learn what the different nozzles are used for and can then select the correct nozzle for the task you are about to do. Now that you have your surface prepped and your pressure washer assembled and loaded, you can start washing. Grab your protective gear like gloves and safety goggles so dirt doesn’t get caught in your eyes. You should also wear old or safety clothing so you won’t end up ruining your new clothes with splashes of dirt. Keep a 25 – 38 cm between the nozzle and the concrete driveway so you don’t end up damaging your concrete but can still get all the dirt loose. Work in a symmetrical pattern and wash away all the dirt. For tough stains and grime, you can get a bit closer with the nozzle. The magic option ! Addition of bleach. The addition of bleach onto the surface after it has been cleaned will increase the result by 30% ! The secret method is to remove as much dirt as possible with your pressure cleaner then apply by mop ,spray or broom a solution of bleach to the surface . Leave the solution on for 20 min then hose off being careful not to let your solution come into prolonged contact with plants or your lawn. The water will dilute the bleach as you rinse. Pool chlorine is the most popular form of bleach used in commercial pressure cleaning. It can be diluted up to 10 – 1. please wear safety glasses, gloves and old clothes. Once your concrete is clean you should allow it to fully dry before allowing people and vehicles to cross over again.If you chosse to seal your driveway make sure its super dry ! Spring and summer are seasons better suited for applying sealer.